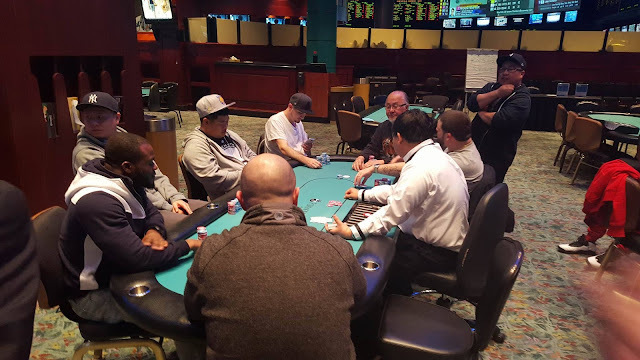 There were a total of 142 entries into today's $300 NLH Big Stack Event. 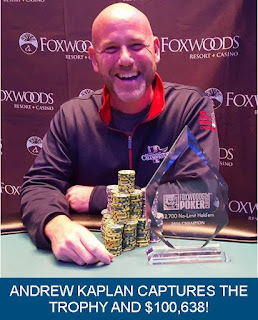 David Stefanski and Andy Kaplan have agreed to chop the remaining money evenly, and Kaplan will take the trophy, having the most chips at the end of play. Congrats to both players on a huge win! The final two players (David Stefanski and Andy Kaplan) have agreed to pay $90,000 to second place, and first place will take the trophy along with $111,275. Andrew Dean is all in holding [4c][6c], and Andy Kaplan has called holding [ac][7h]. The board runs out [jh][9h][5s][5d][qd]. 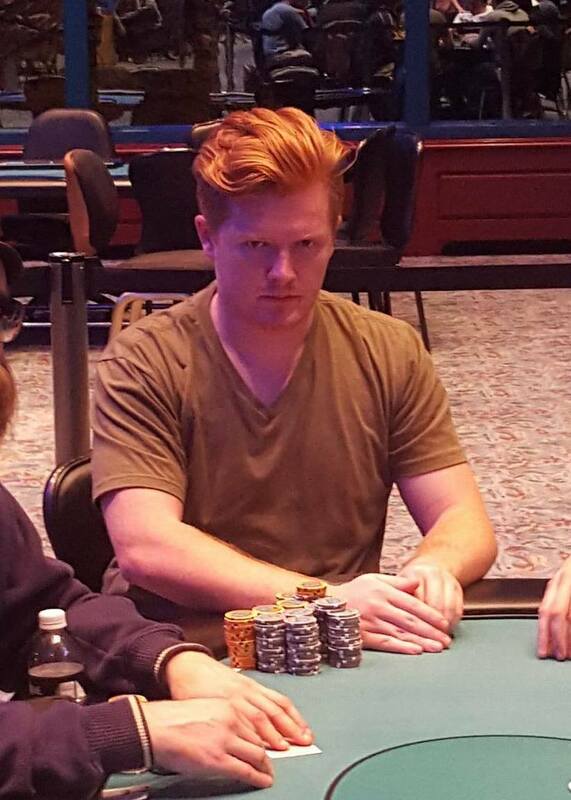 Kaplan's ace high will take it, and Dean is eliminated in 3rd place with a $49,955 payday. Head over to twitch.tv/blindstraddle for commentary of the Main Event final table. 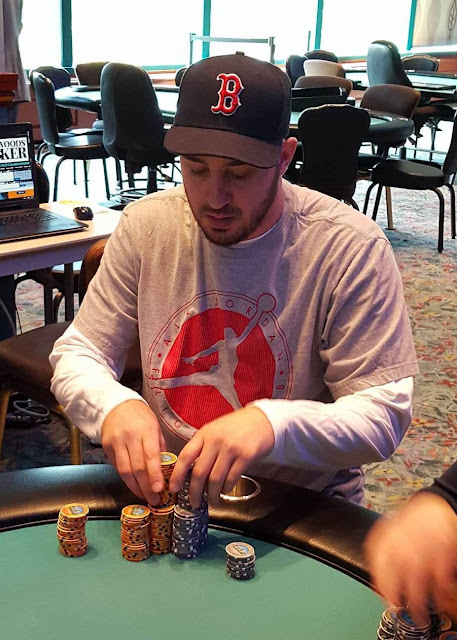 Bradley Yazici shoves all in from under the gun, Stefanski folds on the button, and before Kaplan makes a move in the small blind, Andrew Dean asks for a count. 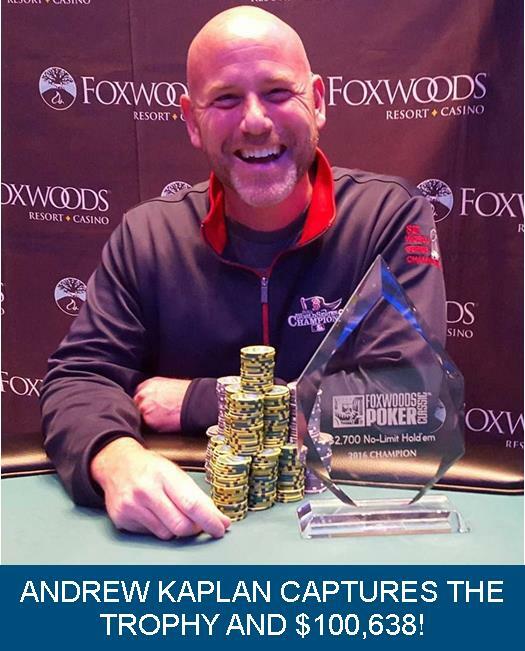 Kaplan folds, and the dealer counts out the 507,000 in chips, and Dean calls. The board runs out [kc][jc][3d][7s][ac], eliminating Yazici in 4th place, paying $40,013. Bradley Yazici shoves all in and Andrew Dean calls. 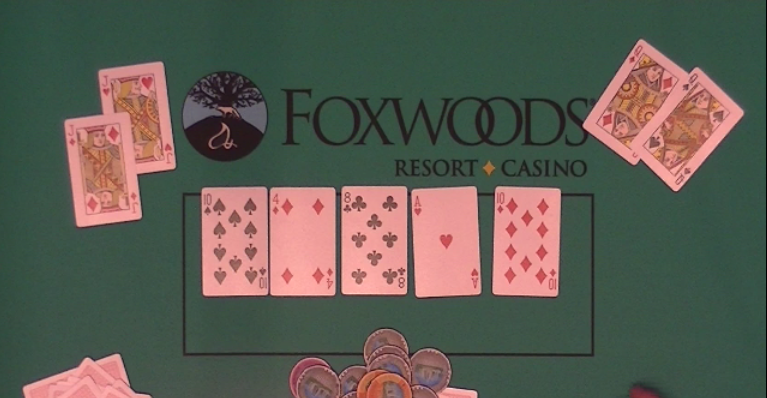 The board runs out [10c][5d][4h][qd][2d], awarding Yazici a full double up. Tony Ruberto shoves all in from the cutoff, and it folds to Andy Kaplan in the big blind, who tank calls the all in. 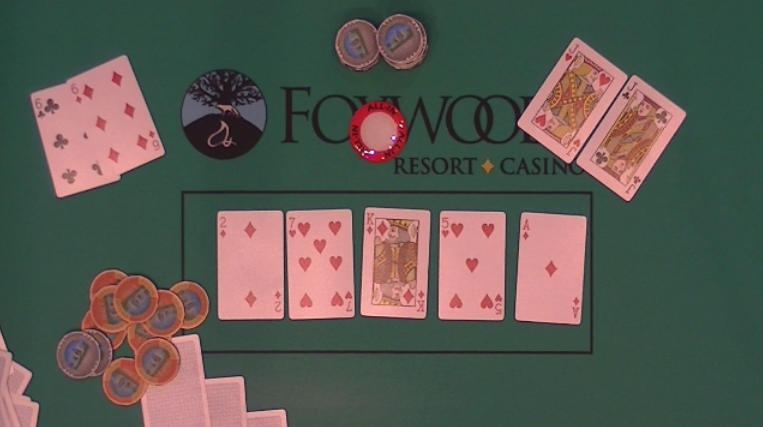 The flop comes [10h][9h][2h], giving Ruberto a pair of nines, but giving Kaplan flush outs. The [qs] turn gives Kaplan a pair of queens for the lead, and the [4h] river brings the flush, eliminating Ruberto in 5th place. Tony Ruberto raises to 55,000 from under the gun. 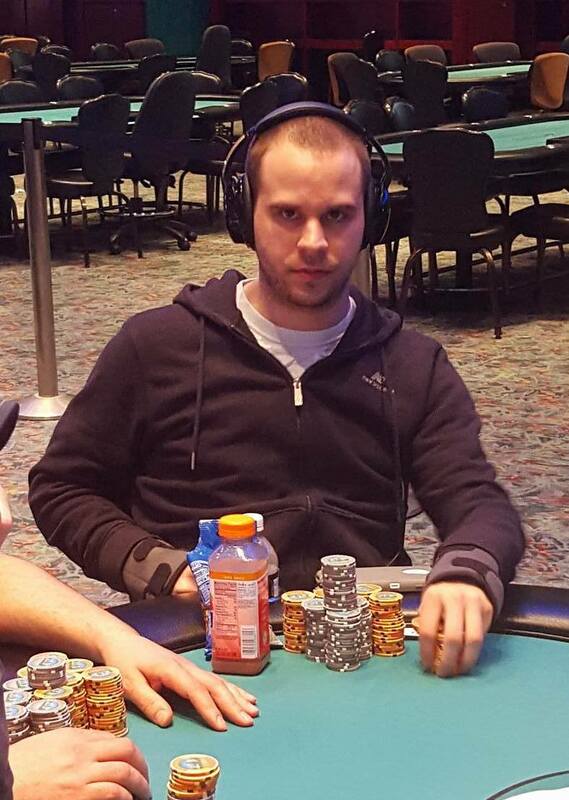 Action folds to Brandon Shambach in the small blind who shoves all in. Ruberto asks for a count and upon hearing the 266,000 total, Ruberto starts talking about the possible hands Shambach could have. "Do you have aces?" Ruberto asks Shambach. Shambach shakes his head no, and Ruberto insta-calls. The flop comes [qc][10h][jc], giving Ruberto the lead with his two pair, but giving Stambach outs to win the hand. The [jd] on the turn gives Ruberto a full house, and the [4h] river is the end. 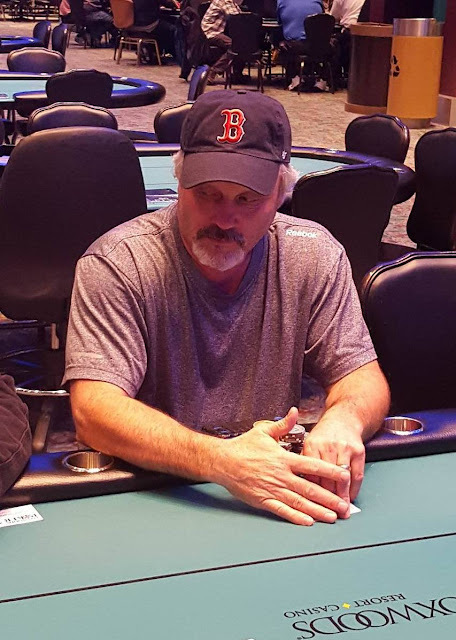 Stambach is eliminated in 6th place, taking home $24,008. On a board reading [10c][5d][7d], Mike Nye shoves all in and Andrew Dean quickly calls. 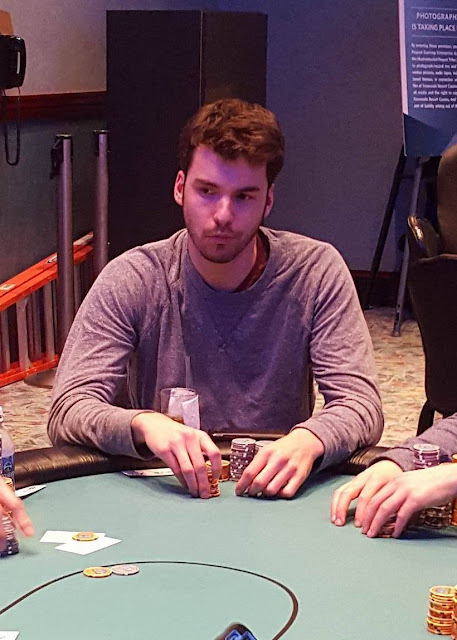 The [9h] turn and [5s] river do not improve Nye's hand, and he is eliminated in 7th place, paying $19,400. On a board reading [8s][7d][3d], Tom Dobrilovic shoves all in holding [jc][jh], and gets called by an opponent holding [ac][ad]. The [3c] turn and [6h] river do not improve Dobrilovi's hand, and he is eliminated in 8th place. Tony Ruberto raises to 30,000 in middle position, and Mike Nye calls on the button. 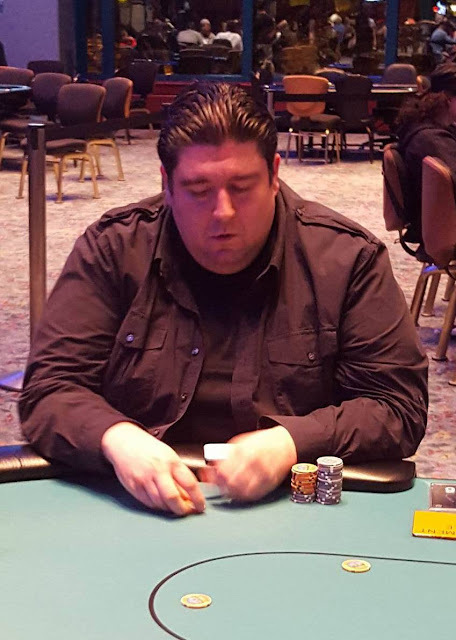 Brad St. Vincent shoves all in from the big blind. Ruberto re-shoves over the top of St. Vincent, and Nye folds. The board runs out [kh][qh][10d][kd][5c], eliminating St. Vincent in 9th place. If you would like to watch the final table of the $2,700 Championship event with commentary from Chris 'Fox' Wallace and Minnesota Molly live on the floor at Foxwoods, head on over to twitch.tv/blindstraddle. On a board reading [2c][qh][9c][5s], Brad St. Vincent shoves all in holding [jc][10c], and gets called by an opponent holding [qd][6d]. While his opponent is in the lead, St. Vincent has a lot of flush and straight outs. The [ks] on the river brings him the straight, and he is awarded a full double up. Mike Nye is all in and has been called by Tony Ruberto. The board runs out [kd][7h][2d][5h][ad], awarding Nye a full double. Andrew Dean raises to 23,000 in middle position, Brad St. Vincent calls in the cutoff, and Jaime Kaplan raises to 70,000 in the big blind. Both Dean and St. Vincent call the raise. Dean and St. Vincent both check the [qs][9s][7s] flop, and Jaime Kaplan bets 100,000. Dean quickly shoves all in, St. Vincent folds, and Kaplan calls for less. 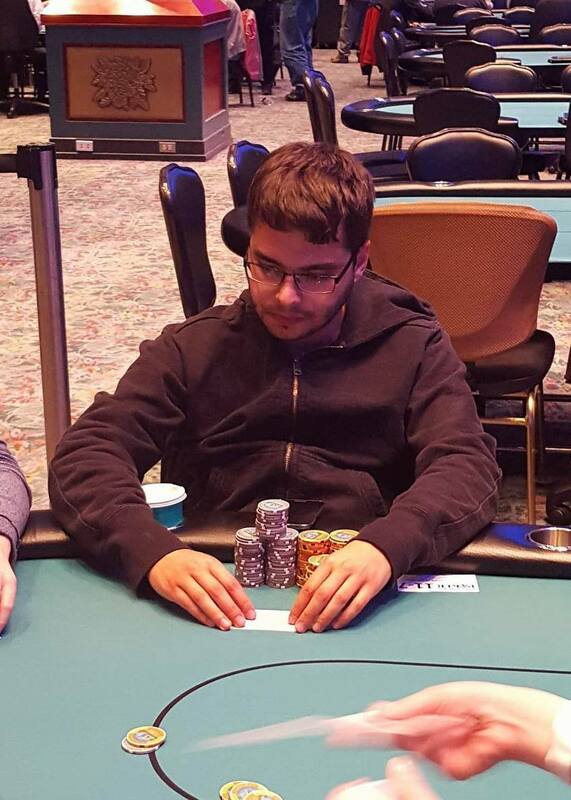 The [9d] turn and [ah] river gives Dean the winning hand, and Kaplan is eliminated in 10th place, paying $8,730. 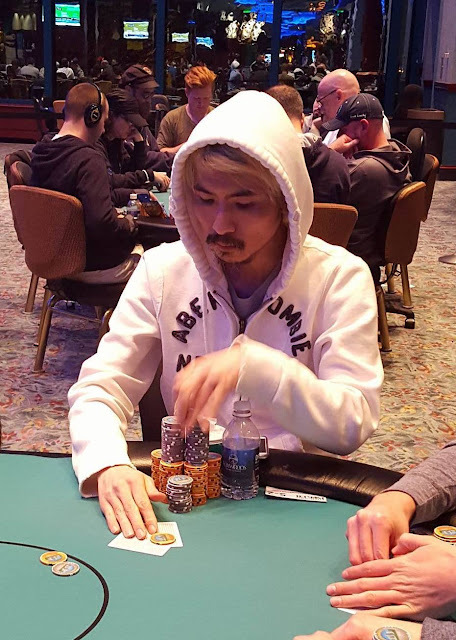 Je Wook Oh shoves all in on the button, and Dave Stefanski calls in the big blind. The flop comes [qd][jc][2s], giving Stefanski a pair for jacks to take the lead. Unfortunately for Oh, the [8c] turn and [7c] river do not improve his hand, and Oh is eliminated in 12th place. Steve Tabb is all in holding [kc][qc], and has been called by an opponent holding [7d][7c]. 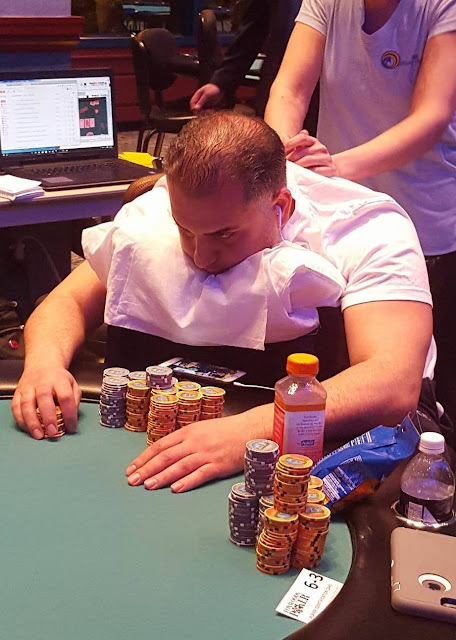 The board runs out [ac][8h][6d][3d][2d], eliminating Tabb in 13th place, paying $7,760. Play has concluded for the night, and players are now bagging and tagging. 13 will return to play Day 3 tomorrow at 11am. 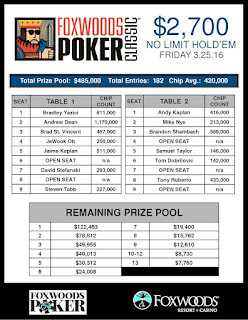 They will return to play 5,000/10,000 blinds with a 1,000 ante, and average chip stack will be 420,000. 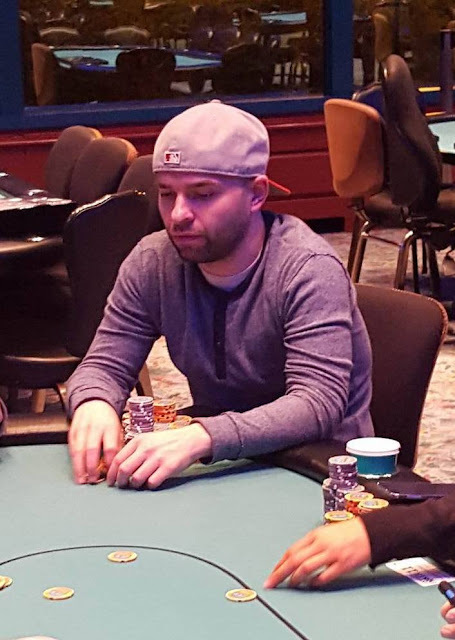 The chip leader heading into Day 3 is Andrew Dean, with 1,170,000. 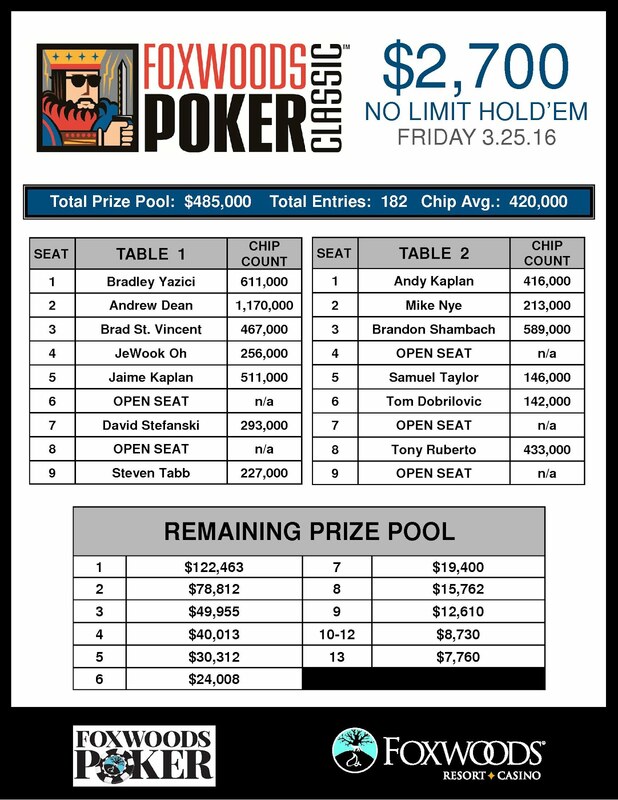 A full list of players and chip counts will be posted later this evening. 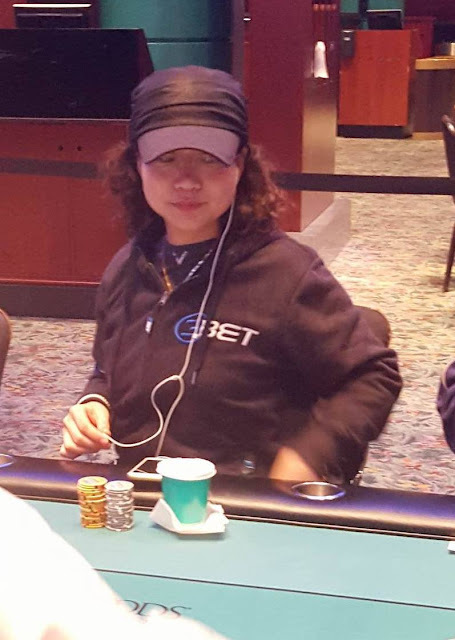 Jing Zhang shoves all in, and Brad St. Vincent calls. The board runs out [ac][3s][qc][2s][4d], eliminating Zhang in 14th place. 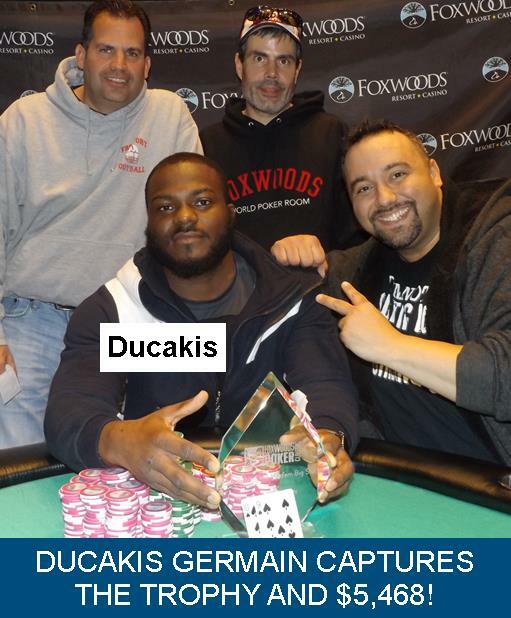 On a board reading [7s][3s][5c], Chris Limo checks in the big blind, and Andrew Dean bets 100,000 in the cutoff. Limo quickly shoves all in. Dean asks for a count, and upon hearing the additional 253,000 he will have to call, he goes into the tank. After a minute, Dean calls. The [10c] turn is safe for Limo, but the [10d] on the river pairs the board, and gives Dean a higher two pair. Limo is eliminated in 15th place with ten minutes left in play tonight. The remaining 21 players are now on the last break of the night. They will play two more levels before bag and tag. Chris Limo raises to 15,000 on the button, and Jaime Kaplan calls in the small blind. 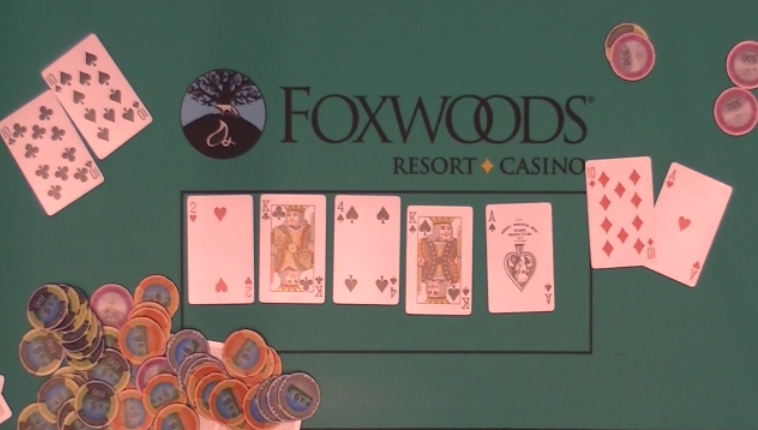 Rene Rodriguez shoves all in for 26,500 in the small blind, and Lino re-shoves over the top. Kaplan asks how much more he would need to call Limo's all in, and upon hearing the 85,500 more, Kaplan also calls, having both players covered. The flop comes [ah][8h][6c], giving all players a pair of aces, and leaving Limo in the lead with his king kicker. The turn is the [3d]. "Two," shouts Limo. The dealer then deals the [2d], and Limo says, "Yes!" **All remaining players are now in the money. On a board reading [kh][qh][2c], Peter Sennon checks in the small blind, Curt Kohlberg checks in the big blind, and Matthew Wantman bets 14,000 in the cutoff. Sennon calls the 14,000, and Kohlberg goes into the tank. After nearly two minutes, Kohlberg moves 60,000 in chips in front of him. Wantman shoves all in for 97,000 total. Sennon hesitantly folds, and Kohlberg calls. When the [qs] comes on the turn Wantman says, "Yes," having turned a full house. The [ac] comes on the river. 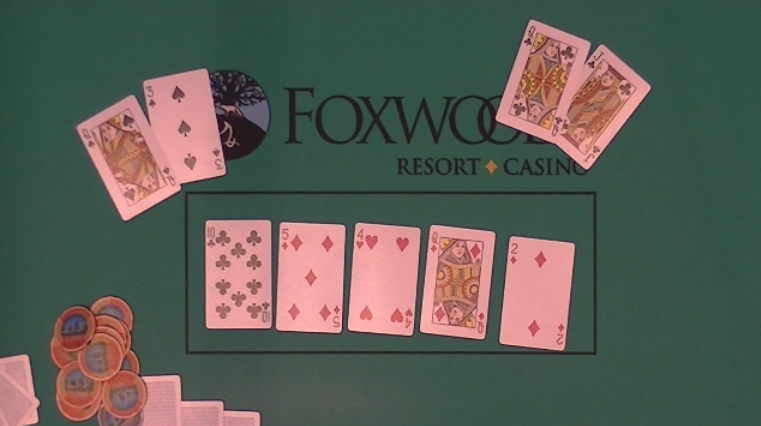 Sennon tells the table that he folded [ad][qd], and Wantman asks, "Really?" Sennon shakes his head yes. All remaining players are now hand for hand until the money bubble bursts and 21 remain. Tim Reilly is all in and has been called by Andrew Dean, who has Reilly covered. Reilly is in great shape as the flop and turn come [qd][qh][4c][6s], but the [ks] on the river gives Dean a full house, and Reilly is eliminated from play just four shy of the money. On a board reading [10s][4d][8c], Luis Vazquez is all in, and has been called by Curt Kohlberg. Vazquez turns over [jd][jh], and when Kohlberg turns over [qd][qs], Vasquez says, "Of course, that's exactly what I put you on too." The [ah] turn and [10d] river do not improve Vasquez's hand, and he is eliminated in 26th place. Jaime Kaplan raises to 8,000 from under the gun, and Michael Garavuso shoves all in from middle position. Kaplan calls. The board runs out [10d][3h][2c][8c][Qd], eliminating Garavuso from play within ten from the money. The remaining 33 players are now on a 60 minute dinner break. 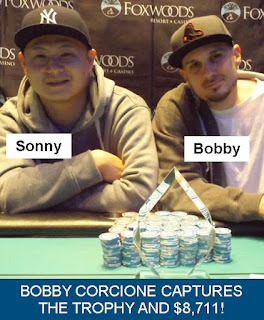 They will return to play 2,000/4,000 blinds with a 500 ante. We are paying 21 players, and prize pool information can be found here. Tonight we will play through level 19, and play will resume for Day 3 at 11am tomorrow (Tues. March 29th). Fred Paradis raises to 5,500 on the button, and Bradley Yazici makes it 13,500 in the small blind. Tim Reilly folds his big blind, and Paradis calls the raise. The flop comes [ah][9c][7h]. Yazici bets 12,000, and Paradis calls. The turn comes the [6c]. Yazici checks, Paradis bets 25,000, and Yazici calls. Both players check the [10d] river. 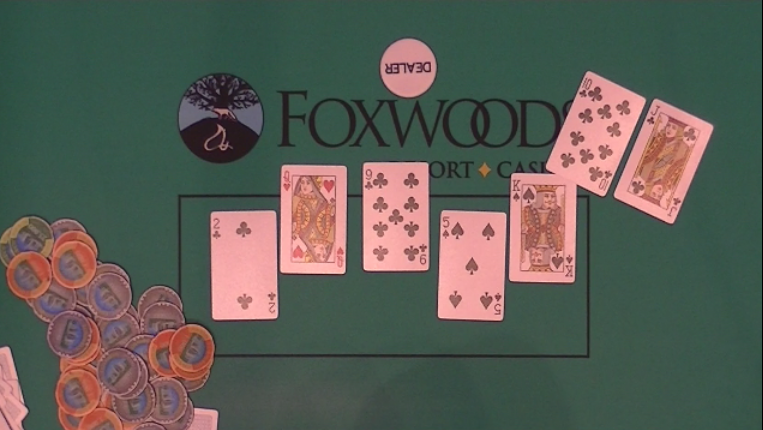 Yazici turns over [as][jc] for a pair of aces, and Paradis mucks his cards. 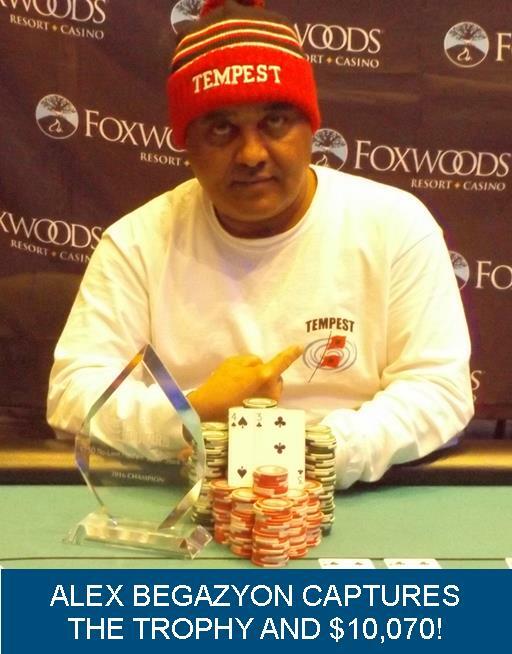 There were a total of 161 entries in today's $300 No Limit Hold Em Big Stack event. The remaining 38 players are now on a 15 minute break. Play will resume with 1,200/2,400 blinds, and a 400 ante. 21 players will officially make the money. On a board reading [2h][kc][4s], Chris Tryba is all in, and Peter Sennon has called. The [ks] on the turn keeps Tryba in the lead, but when the [as] comes on the river Tryba stands up and says, "It just never ends," as he gathers his belongings and walks away from the table. "I really thought my ace high was good," Sennon says as he stacks his newly acquired chips. Nick Palma shoves all in from the cutoff, and Russell Jennings calls on the button. The flop comes [10c][6s][8c], giving Palma a pair of tens. 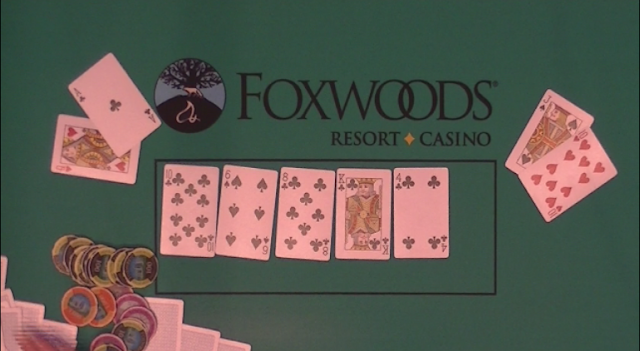 The [kc] on the turn gives Palma straight outs, but also gives Jennings flush outs. 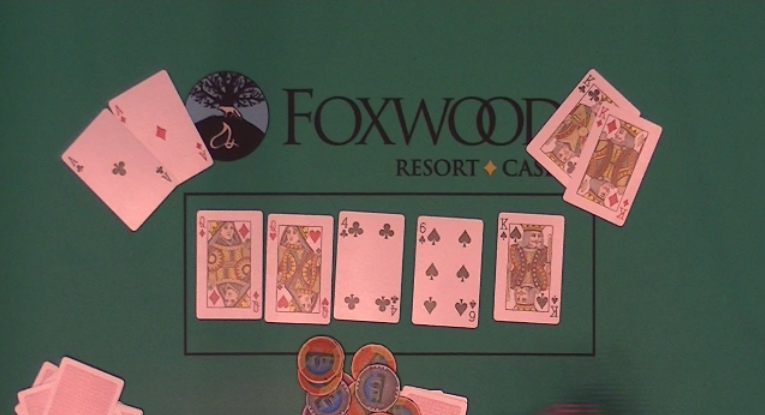 The [4c] on the river gives Jennings the flush, and Palma is eliminated from play. 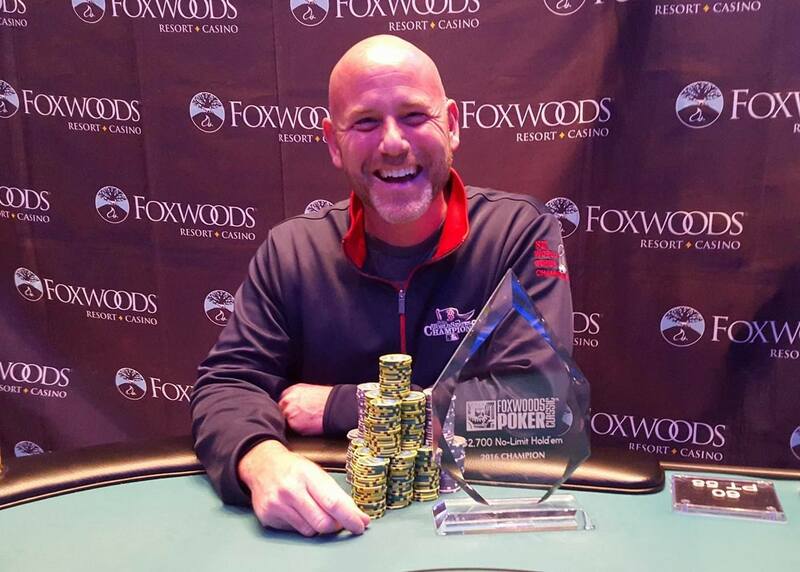 Busto @FoxwoodsPoker main event in 65th place. short stack QJ<A8 on Qs8s8x2x. GL to everyone left. Pretty stack remaining field. Jaime Kaplan shoved all in on a board reading [qh][6c][2d][2c][4d], and Soukha Kachittavong calls. Kaplan shows [kd][qd], for a pair of queens to take the pot. Kaplan is now sitting at 125,000, while Kachittavong is left with only a single ante (200) behind. 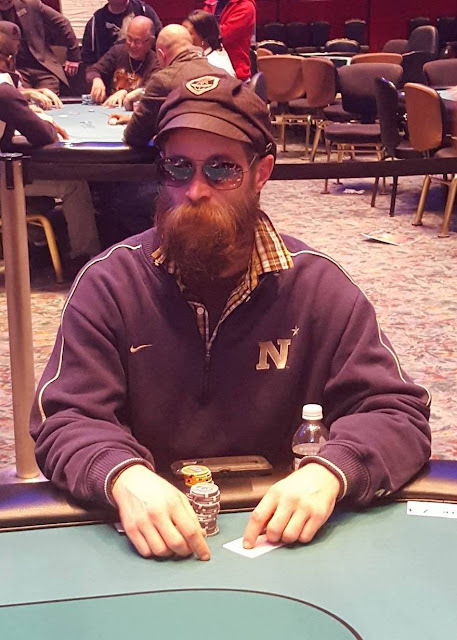 On a board reading [kc][10h][6h], Mike Nye checks in the small blind, Nick Palma checks in the big, and Chris Tryba bets 5,500 in the hijack. Only Nye calls. Both players check the [as] turn. 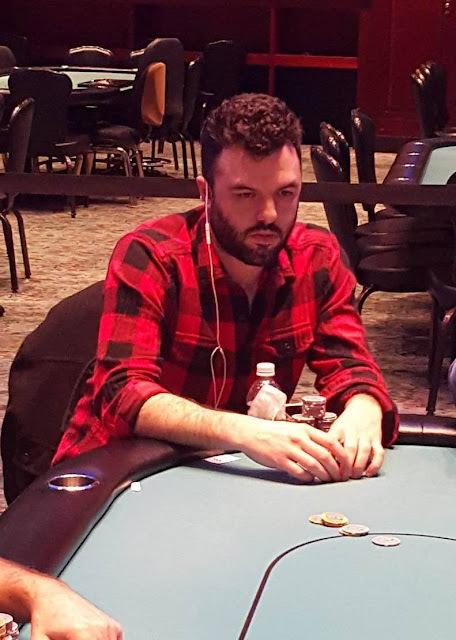 When the river comes the [3d], Nye leads for 12,500, and Tryba releases his hand.